General Motors (GM) announced on May 31, 2015 that it was recalling about 330,000 of its full-size pickup trucks in the United States. This is the latest recall involving defective Takata airbag inflators, bringing the total number of recalled vehicles in the US to about 34.1 million. The National Highway Traffic Safety Administration (NHTSA) previously announced the recall of 33.8 million vehicles in the US with Takata airbag inflators on May 19, 2015, which doubled the number of affected vehicles. The NHTSA recall number for this case is 15E-041. The latest recall includes the 2007 and 2008 Heavy Duty versions of the GMC Sierra and Chevrolet Silverado pickups. The purpose of this recall is to replace the airbag inflators on the passenger side of these trucks. The NHTSA has cited exposure to moisture as a possible cause of the problems with these inflators. The inflators for the front passenger airbags may rupture when the airbag deploys due to the long-term presence of moisture. This defect may result in metal fragments from the inflator striking the truck’s occupants, which may cause serious injury or even death. However, GM has said it isn’t aware that any of the airbags in the recalled trucks have actually been affected by moisture. The automaker added that it hasn’t received any reports of fatalities, injuries or crashes involving these airbags. The Office of Defects Investigation (ODI) began investigating the airbags in June 2014 as case PE14-016. This case was initially based on six incidents in which vehicle airbags ruptured during deployment. All six of these vehicles were in Florida or Puerto Rico at the time of the incident and for most of their service life. Takata was the manufacturer of all six inflators, and ODI also determined that five other manufacturers made similar inflators. All of these manufacturers initiated regional recalls of their inflators within two weeks due to pressure from the ODI. These recalls initially included Florida, Hawaii, Puerto Rico and the U.S. Virgin Islands, which have warm temperatures and high humidity throughout the year. The inflators in the recalled vehicles were replaced, and the original inflators were returned to Takata. Subsequent testing on these units determined that their failure rate was significantly higher than expected. The ODI then requested the vehicle manufacturers to expand the recall to include other areas with high humidity such as the Gulf coast. At this time, no inflators outside the expanded recall area are known to have ruptured during testing. Another eight inflators ruptured in the field during the course of the investigation, including two that weren’t in areas of high humidity. The ODI then requested manufacturers of the affected vehicles to expand their recalls to include the entire United States. The ODI investigation now includes all manufacturers that are known to be affected. In the future, this investigation is expected to focus on an analysis of the root causes, additional consequences of the defect and the remedy’s adequacy. The NHTSA describes the details of this recall in Campaign 15V324000. A total of 374,715 trucks are affected by the latest recall involving Takata airbag inflators. This total includes 330,198 trucks in the US, 39,630 trucks in Canada and 4,887 trucks exported to other countries. 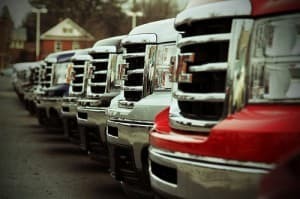 It specifically includes the 2500HD and 3500HD Chevrolet Silverado trucks manufactured during the 2007 and 2008 model years from November 28, 2006, to August 29, 2008. This recall also includes the 2500HD and 3500HD GMC Sierra trucks manufactured during the 2007 and 2008 model years from November 27, 2006, to August 29, 2008. GM will notify the truck owners of the recall, and the trucks will be repaired by GM dealers at no charge. The automaker has not announced a specific notification schedule as of May 31, 2015. Chevrolet truck owners can call Chevrolet customer service toll-free at 1-800-222-1020. GMC truck owners can call GMC customer service toll-free at 1-800-462-8782. GM’s internal recall number for this issue is 15438. Truck owners may also obtain more information on this recall by calling the NHTSA Vehicle Safety Hotline toll-free at 1-888-327-4236. The corresponding toll-free TTY number is 1-800-424-9153. This information is also available at www.safercar.gov.